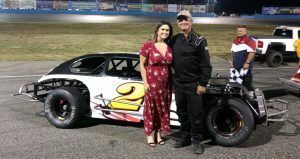 Vintage Modifieds were at Wenatchee Valley Super Oval (WVSO) on Saturday, August 11th, 2018 for a fun night of racing. 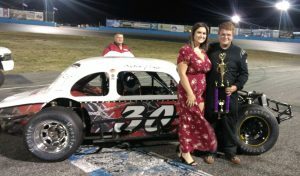 They raced in an 8-lap Heat race and a 35-lap Main Event race. The cars are in the line-up for practice. Getting only 10-minutes, twice, for the night. Once racing began, all cars were on the track for the Heat race with Ken Kaltschmidt coming in 1st. 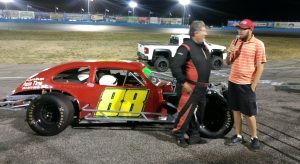 However, once the race ended Ken Kaltschmidt in the 27-car and Jim Jones in the 03-car broke and were unable to take their cars on the track for the 35-lap Main Event. 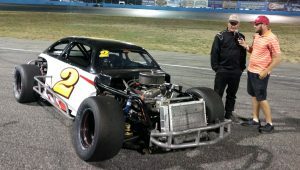 However, Chris Cook in the number 1-car agreed to run Jim Jones #03 and Rick Villyard in the number 2-car let Ken Kaltschmidt race in his car for the Main Event for the #27. What great sportsmanship, these two men/car#’s are running first and second in points. Chris Cook and Rick Villyard are great sportsman! 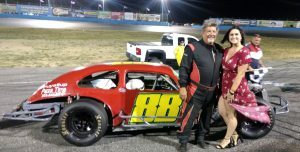 Robert Rux, #88 led the first 8-laps of the Main Event. Ken Kaltschmidt gained on Robert taking the lead, with Kyten Jones on his tail. 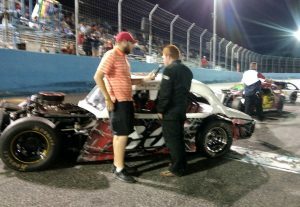 On lap-29, Kyten Jones in the 30-car connected with Ken Kaltschmidt going into turn-2, spinning out the 2-car and taking the lead. Now under the yellow caution flag, the cars were put into a new line up with only 6-laps to go. Robert Rux and Vern Huson now in front, Kyten Jones and Ken Kaltschmidt behind. Kyten Jones was sent to the back for causing a wreck. Green flag flew, race ending with Kyten Jones taking 1st, Robert Rux taking 2nd and Ken Kaltschmidt taking 3rd in the Main Event. Congrats to each team!